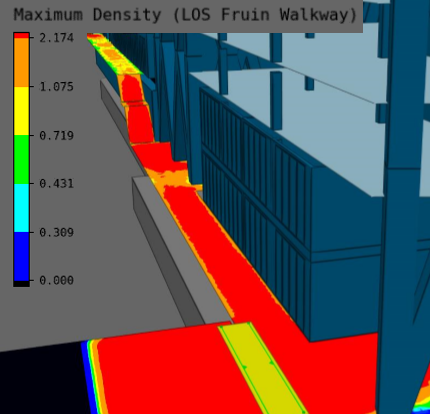 Students participating in the MEGA master’s degree course at the Faculty of Architecture and the Built Environment at the Delft University of Technology have added MassMotion pedestrian simulation to their software experience. Demonstrating the ease with which MassMotion can be learned and used alongside other software tools. The MEGA course focuses on interdisciplinary design and integration of different areas of expertise, and lecturers are from practising architectural, engineering and design firms. 11 different teams of students were tasked with a project involving the design, computation, engineering and construction management of a large, high rise building. The 2018 assignment is a high-rise building in Rotterdam Central District (RCD). RCD is the area centred on Rotterdam Central Station, and is earmarked for further development focussing on work, play and living for kinetic urbanites. The MEGA design project focussed on a high-rise as a vertical extension of the Groot Handelsgebouw. The Groothandelsgebouw, designed by Maaskant and Van Tijen and built in 1951-53, epitomises the post-war reconstruction of Rotterdam, and is often described as a city within a city. The design of a complementary high-rise next to the complex seeks to understand, predict and cater for the varied needs of mixed-use building users. The student team’s original idea was to import their SketchUp model into MassMotion, but found that their model did not yet have a sufficient level of detail to be make use of the features they were discovering in MassMotion. To get a real feeling for traffic area dimensions, a rough Rhino model was therefore imported. The information gathered from this model and its accompanying simulations were used as input to design the traffic areas. The SketchUp model was then updated and imported into MassMotion. This interaction between MassMotion and SketchUp was easily repeated several times as the model was further refined. Data for the amount of people was derived from work already done on lift design and translated to an overview of the journeys the agents were going to follow in MassMotion. Initially the lifts were simplified in MassMotion, they were merely destination portals were agents would go to and finish their journey. As the students quickly became more familiar and confident with the software, they added more lifts and double deck lifts to give a more realistic result. The agents could now be seen waiting for lifts and potential congestion was revealed in easily-interpreted heat maps. Before any design changes were made, alternative solutions were considered. 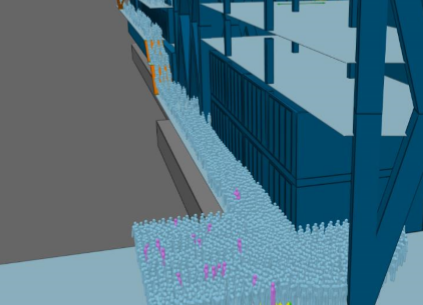 The speed with which new data could be added and of MassMotion’s iteration made it easy to test multiple scenarios. rearranging the stairs in the walkway and the atrium. One of the most effective changes suggested by MassMotion outputs was adding extra entrances to the building. Initially there was one large main entrance at the south east corner.